Asifabad Sirpur 9493001245 Revenue Divisional Officer, Kagaznagar . 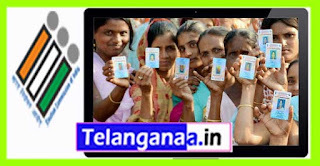 Nizamabad Nizamabad (Urban) 7331187218 Electoral Registaration Officer 017-Nizamabad Urban & Commissioner, Municipal Corporation, Nizamabad. Kamareddy Jukkal (SC) 9492022593 Revenue Divisional Officer, Banswada. Behind Reddy Sangam, Chaitanya Nagar, Banswada. Kamareddy Yellareddy 9492022119 Revenue Divisional Officer, Yellareddy H.No. 5-5-88, Teachers Colony, Yellareddy. Peddapalle Manthani 7995070705 Revenue Divisional Officer, Manthani. Peddapalle Peddapalle 9849904355 Revenue Divisional Officer, Peddapalli. Karimnagar Manakondur (SC) 9849900092 Chief Executive Officer,Zilla Parishad, Karimnagar. Karimnagar Sircilla 9849904356 i/c Revenue Divisional Officer,Siricilla. Rangareddy Ibrahimpatnam 9849904206 ERO &Revenue Divisional Officer (RDO), Ibrahimpatnam Division. 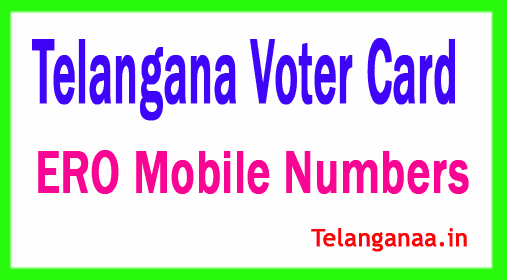 49 Lal Bahadur Nagar 9989930589 Electoral Registration Officer, 049-Lal Bahadur Nagar Assembly Constituency & Deputy Commissioner, Hayath Nagar Circle-3A, GHMC. LB Nagar Municipal office, Venkateshwara colony, Saroor Nagar Mandal, Beside MRO office, PIN-500035. Rangareddy Maheswaram 7995086353 ERO & RDO, Kandukur Division.Rangareddy. Rangareddy Chevella (SC) 9652187655 RDO CHEVELLA, HYDERABAD-48. Medchal Uppal 9989930269 ERO & I/c. Deputy Commissioner, Circle No:2. GHMC, Uppal. adrs: Uppal Ring X road, Uppal, Rangareddy, Telangana. Hyderabad Amberpet 9963550421 Deputy Commissioner Circle No.9B, GHMC. & 6th Floor, Abids parking Complex,Abids,GHMC. Hyderabad Khairatabad 9849006062 Deputy Commissioner Circle No. 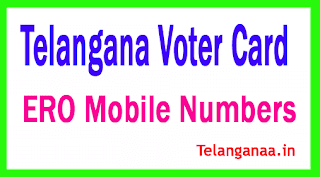 10B, Khairatabad, GHMC.No.10,Khairathabad,GHMC. Hyderabad Jubilee Hills 9963854999 Deputy Commissioner Circle No. 10A, Khairatabad, GHMC. Hyderabad Sanathnagar 7995079769 Joint Commissioner, Circle No.18, GHMC. & IIIrd Floor, Zonal Commissioner (North) Office, behind city civil court, Marredpally, Secunderabad. Hyderabad Secunderabad 9000811018 Deputy Commissioner Circle No.18,GHMC. & 3rd Floor, Zonal Commissioner(North) Office,behind city civil court,Marredpally,Secunderabad. Mahbubnagar Devarkadra 8008901002 Electoral Registration Officer 76- Devarkadra A/C, & CEO,ZP, MAHBUBNAGAR. Nagarkurnool Kollapur 9440803063 SPECIAL DEPUTY COLLECTOR,MGLISP, NAGARKURNOOL. Yadadri Alair 9494943065 DRDO, Yadadri. Jangoan Palakurthi 9849902168 Chief Executive Officer, O/o ZP ,Warangal. Bhadrachalam Pinapaka (ST) 8374644153 Special Deputy Collector, (Tribalwelfare), Bhadrachalam, Bhadradri District. Bhadrachalam Yellandu (ST) 8008579573 Spl.Dy.Collector (LA) RDLIS & ISRLIS, Paloncha,Bhadradri District. Bhadrachalam Aswaraopeta (ST) 9490957005 Project Officer,ITDA, I/C Bhadrachalam, Bhadradri District. Khammam Khammam 9849906081 Revenue Divisional Officer, Khammam, Khammam District. Khammam Madhira (SC) 7095502002 Additional Project Director(EGS), DRDA, Khammam,Khammam District. Khammam Wyra (ST) 9440222333 Joint Collector, Khammam District. Khammam Sathupalle (SC) 9441475367 Revenue Divisional Officer,Kalluru, Khammam District.